After a few tough weeks the colts were sitting in 3rd place in the league and were up against a team 1 point behind us who also had a game in hand on us. We’d drawn 3-3 with Poole Town when we played them earlier in the season, having been 2-0 behind so we knew we were capable of playing good attacking football against them. In very wet and extremely windy conditions the game started with Poole Town on the front front, having the majority of possession in the opening 15 mins, but the colts defended very well and left George with nothing to do. For the remainder of the first half we began to get on the ball a bit more and create some half chances of our own, the best being Sam running onto a through ball and knocking it round the keeper but his touch was just to heavy to get a shot on target. Our higher line meant George also took up a higher starting position meaning he was able to deal with several through balls from Poole town very well and also be an option for our defenders in possession. The half time score of 0-0 was probably fair, with neither keeper really having to make a save. The half time message was that we were impressed with our defensive organisation but we wanted to try to keep the ball more in order to get in control of the game and fashion a few more chances of our own. Thankfully that is exactly what happened, when on the ball we got players wide and had some good passages of play getting us around the opposition penalty area, but again the final pass or shot didn’t quite come off and we still hadn’t properly tested the keeper. With the game opening up as it did the defence had to perform even better and they did so, communicating with each other and putting in good tackles to stop the Poole Town breaks. The first real chance of the game fell to Poole Town; after a string of poor clearances from Broadstone a cross into the box saw their striker connect with a bouncing ball brilliantly from around 8 yards at the near post and the ball seemed destined for the far top corner before George threw himself across his goal and got his top hand to the ball to palm it away, leaving the managers and coaches of Broadstone and Poole Town in disbelief. This seemed to trigger a reaction in the stones’ players, and their passing play seemed to gain the speed and accuracy that had at times been lacking so far. A passage of possession down the right hand side led to a clever through ball which drew the opposition keeper out of his box to get there before our striker, however his clearance was low and fell to Sam P around half way into the attacking half who showed incredible composure to almost pass the ball beyond the keeper into the far bottom corner to give us a well earned lead. The remaining 15 minutes was seen out well by Broadstone, showing good game management skills for the first time this season, not over committing to attacks and saying strong defensively to ensure Poole Town didn’t have anymore clear cut chances, meaning the game finished 1-0. Man of the match went to George, although he didn’t have much to do his starting position was much improved to mean he didn’t have to make the saves as he went and won the ball before the striker when he needed to. It’s easy for a goalkeeper to switch off when they have a quiet game but to stay focused for the entire match and pull off an incredible reaction save that seemed to turn the game in our favour it is much deserved. Although it was a very different performance to what the players have shown so far this season in terms of the amount of possession we had, they should all be very proud of how well organised and disciplined they were defensively to give Poole Town so few opportunities and how they capitalised on the main one we created. If they can combine the passing football with that defensive resilience they are sure to do well going forward. This week’s game was a league cup match and having lost our first league cup match out of 3 we knew that we needed to win this one. We had played Verwood in our first game of the season and won a dramatic 7 goal thriller 4-3 so we were hoping for the same result but hopefully making it easier for ourselves. The game started very well, going 1-0 up after just 2 minutes when Sam G drilled a low shot at the keeper which he spilled, leaving Alfie to stab home from close range after making a good run into the box. The score line got even better just 5 minutes later with Alfie again finding the back of the net; Tyler drilled a low cross diagonally across the box towards the far post, which Alfie again found himself in a good position to poke home. Just a minute later we continued to apply good pressure and were unfortunate to not be 3 up when Sam P took a shot from outside the box and saw it come back off the post. For the remainder of the half the colts continued to play extremely well, keeping possession and winning it back very quickly if they gave it away, we had another couple of half chances in the half but nothing to really test their keeper. We were solid defensively with Dan having very little to do for the majority of the half, other than clear the occasional through ball. We started the second half as we had started the first, with fast paced attacking football and 5 minutes later we scored our 3rd and best goal of the game. Tiernan had a throw in on the half way line on out right hand side, the throw went back down the line to George who then played a pass into Alfie in central midfield, Alfie passed diagonally back to Josh out in our LB position who then played a clever through ball down the line for Kieran to run onto who’s drilled shot from outside the area found the bottom left corner. This goal brilliantly summed up what we’ve been working on recently. Unfortunately for next 10 minutes of the game the players began to look tired and rather than focusing on defending our well earned lead our midfielders were caught too far forward, leaving a big gap in front of our defence that Verwood were beginning to create chances from. Their first goal came with around 15 minutes of the game left to go when their midfielder used the time and space he had to pick out a clever through ball into our box which led to one of our defenders getting tangled up with the opposition striker whilst trying to get goal-side and giving away a penalty. Dan did very well to guess the right way however his fingertips weren’t quite enough to stop the well placed penalty. After this our defending did improve slightly, we looked more compact however we couldn’t keep the ball very well which continued to invite pressure from Verwood. With just 2 minutes left a cross into the box from Verwood was turned in making for a very nervous final couple of minutes but the lads held on for what was overall a deserved win. Man of the match went to kieran for his brilliant work rate and what turned out to be the winning goal. This week saw us take on another team we hadn't played before and they were sitting a couple of places above us in the league table so we knew it had to be another strong performance. We started positively and had good spells of passing and moving up the pitch, however the game was different to the last couple of weeks, with Longfleet creating far more chances than us in the first half, and we had some great saves from George and some good defending to thank for the 0-0 score line with just under 20 minutes gone. We'd created a few good chances of our own, with Alfie being through on goal but being stopped by a good save and a couple of offsides. With 10 minutes left of the half we were finally broken down, when their striker was allowed to dribble past our defence far too easily and fire a shot past George. The lads showed a much better reaction to conceding this week, they didn't panic and instead continued to move the ball around well, and with a minute of the half to go we'd earned a throw in near the corner flag, which Dan took and made a good run towards the edge of the box to create a good angle for himself, Alfie played a clever 1-2 from the throw and Dan's shot looped over the keeper to give us a deserved equaliser. Unfortunately we couldn't hold on until half time, in a lengthy spell of added time our defenders were again shy on the tackle in the box and the opposition striker finished calmly to make the half time score 2-1 to them. We decided to change to a slightly more attacking formation for the second half, believing in our defensive organisation as they had prevented a lot of Longfleet chances and adding an extra man to the attack. This seemed to work brilliantly and 5 minutes into the half we were level again, a good shot from outside the box from Alfie came back off the bar which lead to pinball in the area before Dan stabbed it in from close range for his second of the game. The remainder of the second half was a good competitive match up, with neither team creating many clear cut chances. Both teams had good spells of possession in the middle of the pitch. With just a minute of the game left Alfie went on a good driving run into the heart of Longfleet's defence and was brought down by a late tackle, whilst everyone else switched off waiting for the whistle, Josh was alert to the ref playing advantage and to the ball that had rolled into his path, he slotted the ball away calmly to give us the win. Man of the Match went to Josh for a brilliant performance in central midfield in the second half, breaking up a lot of Longfleet's attacks. Another strong performance from the colts in what was a very close game between 2 well matched teams. The lads definitely deserved a win after their recent performances and hopefully we can keep this momentum going. This week in training we had again worked on passing the ball out from the back and short sharp passing moving up the pitch so it was brilliant to se the lads implementing this in the match. Unfortunately just 5 minutes into the game a powerful run from one of Wimborne's players saw him dodge 2 tackles and make his way into the box and finish well to put us 1-0 down early on. However rather than giving up on our short passing like last week it was brilliant to see that we continued this despite the set back and began creating some half chances. With 10 minutes left before half time a run down our left hand side from their midfielder drew our defence across leaving a man unmarked at the back post who finished calmly when the ball got played across. So half time and the score was a disappointing 2-0 and 5 minutes into the second half things didn't get any better, when we conceded a third as a result of going looking for some goals of our own. That was the only negative of our second half, what followed was easily the best I have ever seen the team play. The lads continued the short sharp passing play and really began to open up Wimborne's defence with excellent movement on and off of the ball. With 20 minutes left of the half to go this is where our goal came from. With Wimborne having just attacked George played the ball out to Tyler on the half way line who controlled it brilliantly. The speed we had moved the ball up field meant it was just Tyler and Joseph against 3 Wimborne defenders. Tyler played the ball to Joseph and then made a run through the middle of 2 of the defenders whilst Joseph waited until just the right moment to slot the ball through to Tyler who took 1 touch and finished brilliantly, completely showcasing the passing style we'd been working on. From this moment on in the game Wimborne only very occasionally made it out of their half and didn't really trouble George at all, whilst we forced several good saves from their keeper and played some more excellent football but we couldn't find the goals we needed. Having played so well but still losing I was expecting the players to be quite disappointed however I was very surprised that the first words out of George's mouth were 'that's the best we've played in ages' which was then echoed by several of the other lads. I was worried that by not getting the win for the second week after playing so well on the ball they would begin to doubt the passing style we were looking for but they all recognised how well they played and were clearly very pleased with how the game had gone despite the scoreline. If we continue to play in this way we are sure to win more games than we lose in the long term. Man of the match went to Tiernan as he was very calm in playing the ball out from the back but also some excellent communication throughout the match which is what we lack at times so it was great to be able to hear it from the sidelines! Having worked very hard in training on organisation and short sharp passing and movement the players knew we wanted to see that replicated in the match, but even more than that we wanted to see the fight and determination that we were so used to seeing from the players. From kick off for the first 10 minutes of the game the players passing and movement was excellent, we were passing around and through the opposition in triangles and neat 1-2s and managed to create several chances early on, which their keeper did well to save on a couple of occasions. However at the 10 minute mark a lapse in concentration saw Poole Town take the lead against the run of play. The next 15 minutes of the half was a fairly even match up, with us loosing our way slightly in terms of the short sharp passing, but still creating the majority of the chances with their keeper making another 2 brilliant saves to deny Alfie on both occasions. With 5 minutes of the half left their winger found space around the edges of our back 3 and did well to get to the bi-line before putting in a deep cross which was met with a strong header from just a couple of yards out, leaving Dan with no chance. So at half time we felt hard done by to be 2-0 down, but this is where the players had a brilliant chance to prove that they were again willing to fight until the end, having come back from this position multiple times before. We started well in the second half, not keeping the ball quite as much as we'd like to, but being very compact and quick to win the ball back when we did lose it. 5 minutes into the half we worked our way to the edge of the opposition box, and in a bit of a scramble Sam G did well to slot the ball to our hero against Verwood Sam P, who then finished brilliantly across the keeper into the top corner. Following this we had good spells of pressure and perhaps should've done better from the chances we created. We even had the ball in the net but the goal was ruled out by the referee with no clear reason as to why. With 10 minutes left of the game Poole Town scored again which made me even more proud of what followed in the final 10 minutes of the game. Other teams may have given up after getting back into a game then going 2 goals behind again but we continued to fight and got the rewards we deserved. At this point we changed formation from 3-4-1 to 3-3-2 in search of the goals we needed and just 2 minutes after their goal Tyler did what we'd been begging all the players to do and took a shot from distance on the left hand side of the pitch. His curling effort dipped just close enough to the keeper for him to get finger tips but all he could do was help the ball into the top corner of the net to again bring us back to within touching distance of earning a much deserved point. The boys continued to battle, with the majority of this last part of the game spent in Poole Towns half in and around their box. With just 2 minutes left another shot from distance this time from Josh parried by the keeper and fell to the feet of Sam G who had followed in the shot well, the keeper did well to save his first effort but at the second attempt Sam slotted the ball past the keeper to make the final score 3-3. The players were very impressive in the way they responded to being behind in the second half and when looking at the amount of chances we created we were unfortunate to not take all 3 points. Man of the Match went to George for a very impressive outfield performance, being strong both in central midfield and as part of a back 3, dealing with everything Poole took his way. Next week we play away to Wimborne and will be hoping to get a result without making it difficult for ourselves by going behind first! The Colt's first game of this years league cup saw us again come up against a team we had never played before, but we did know they'd won their first league game 6-0 so it was we knew it was likely to be a difficult game. For the opening period of the game the teams looked fairly well balanced, with both teams creating half chances, however 90% of the time our attempts were stopped by an outstanding performance from Melcombe Regis' centre back. We only had 1 stand out chance of the half when Sam G did what we'd asked all the boys to do and take shots in and around the area. His shot came agonisingly close, it curled round nicely with a bit of help from the wind but hit the join of the crossbar and post and went out for a goal kick. At the other end of the pitch Melcombe Regis were finding their way through our defences far too easily, and had several shots on target before the 15 minute mark, only to be stopped from taking the lead by Dan who made some excellent saves in goal for us. With 10 minutes of the half to go the opposition striker found their way around Dan, finishing well meaning we went in at half time 1-0 down. The second half saw the weather conditions worsen and we ended up playing against very strong wind and rain as well as a strong team. Five minutes into the second half a player from the opposition took a strike from well outside the box, and Dan could do nothing but watch as the ball changed from heading into his far top corner and instead whipped across to his near top corner thanks to the wind. We started to keep the ball down a bit better and create a few chances, but didn't really test the keeper. Half way through the second half another long shot again went from one side of the goal to the other, with Dan doing well to get anywhere near it before it found its way into the top of the goal. 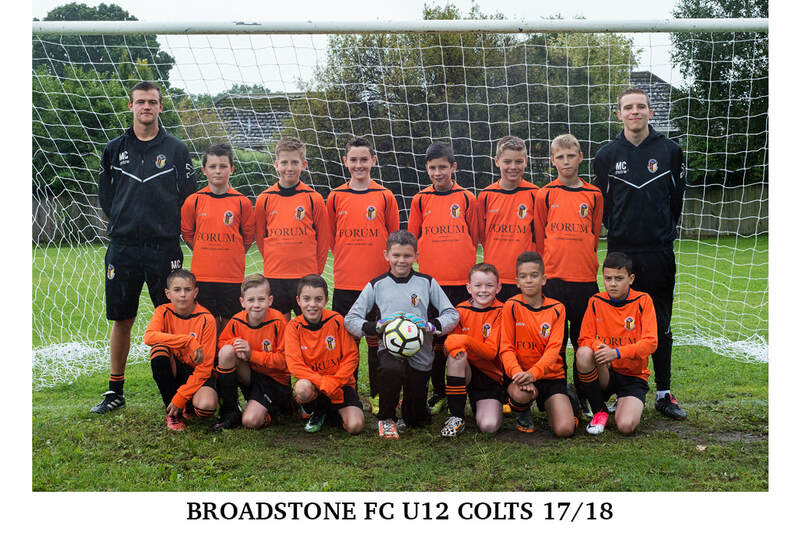 With 10 minutes left we thought we may see another Broadstone Colts come back when Sam G found the bottom corner with a cleverly placed shot after hard work from Sam P around the edge of the box. However Melcombe Regis put the last nail in the coffin 2 minutes later with yet another high long shot. The final result was a 4-1 loss. Man of the match went to Dan who had a superb game and could do nothing about any of the goals we conceded. He made at least 5 brilliant saves particularly in the first half to ensure we still had a fighting chance going into the second. This was a disappointing game from a coaches point of view as we've always said that the result doesn't matter if everyone puts in 100% but it is the first time in 2 years that we couldn't say that we saw the top effort from all of the players. We go again this Sunday against Poole Town Wessex United, a team we have done well against before so are looking forward to to seeing an improved performance. Our first game saw us playing at home against a team we had never played before so we weren't sure what to expect. With 4 subs on the bench for our first game the message to the players was to give everything they had while they were on the pitch as there would be plenty of chances to have a rest and that's exactly what every one of them did. The players started well, passing the ball around quickly and creating a couple of half chances, however just after 5 minutes Verwood's striker found himself with the ball on the edge of our box and a rushed shot saw the ball float over George into the far top corner. After this Broadstone continued to have the majority of the ball, creating several good chances but lacking the composure in front of goal. As we approached the 20 minute mark Sam G made a good run down the touchline and did well to get his head up and cut the ball back to Jospeh who bent the ball superbly into the far corner of the net across the keeper, a much deserved equaliser. However just a minute or 2 later we switched off from our own goal kick as it found its way straight to an opposition striker just outside the box, whose shot skipped up off of the surface to beat George in goal. 5 minutes later the lads created another good opportunity, with Sam again being provider this time for the day's captain Alfie, who finished well from outside the box to again bring us level. We were unfortunate to not go into half time leading, with Kieran bringing an excellent save from the Verwood keeper a couple of minutes before the end of the half. At half time the score was 2-2, with the Broadstone players feeling that they deserved to be infront, and so it was up to them to go out in the second half and prove that that was the case. The half again started well, with the players moving the ball around well in ever-worsening conditions, however we couldn’t seem to find the final ball into our striker. With just 10 minutes left of the half Verwood won a free kick just outside of our box, George got finger tips to the shot but it wasn’t enough to keep it from finding the top corner. Yet again the Broadstone players showed their superb fighting attitude, and with 5 minutes left of the game they came from behind for the third time in the match when Kieran made a brilliant run down the wing from the edge of our box after receiving a short goal kick, all the way to just outside the opposition box, beating several players along the way. His pass inside found Alfie, who instead of shooting, spotted Sam P making a clever run into the box from the left hand side. His pass found Sam brilliantly who took 1 touch and slotted the ball past the keeper to make the score 3-3. The celebrations from the parents and the subs suggested they would’ve taken a draw after such a brilliant fight from the players, however the boys weren’t finished yet. With just 2 minutes of the game left Tyler managed to find a pass to Sam P in a crowded penalty area and Sam knocked the ball past the keeper to give the colts a much deserved first win of the season. Man of the match went to Alfie. In the first half he played as a lone striker and held the ball up superbly, bringing midfielders into play and then looking to receive the ball again himself, even causing the opposition to attempt a man marking set up to keep him out of the game to no avail. He had 15 minutes off after half time and then came back on in a central midfield role and again linked everything together very well. We made it very difficult for ourselves at times during the match, but the player’s attitude and work rate can’t be questioned and long may it continue through the season!